UNIVERSITY PARK — Penn State has a finesse offense, James Franklin admitted, and while it’s actually been that way for a while now and produced a lot of success, the coach knows the unit has to get tougher. 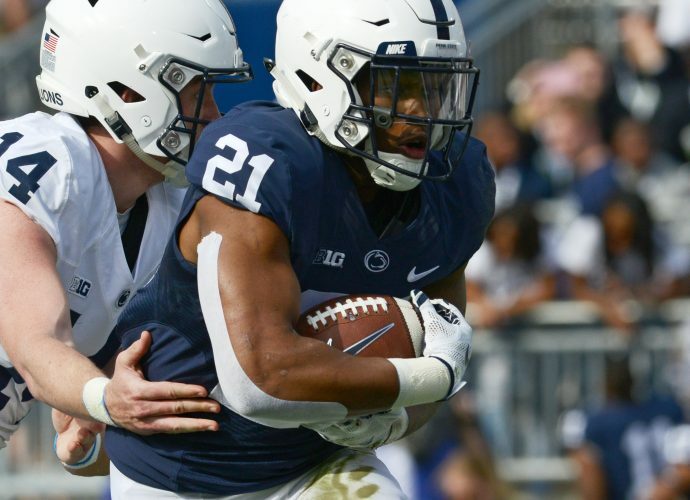 The problem is that now teams have figured out ways to slow down Saquon Barkley and the running game, so some things that had been working well are no longer effective. One major problem with wanting to become a more hard-nosed football team is that offensive coordinator Joe Moorhead’s run-pass option system is actually designed to operate more like a finesse outfit than a power unit. Hence, the lack of a fullback and never having the quarterback line up under center. So the Nittany Lions have a dilemma. They can continue with the status quo, remain more of a finesse offense and succeed against most teams, yet still struggle against powerful defenses. Or, they can tinker heavily with something that has worked very well from a point production standpoint and risk taking steps backward in other areas. “It’s not going to happen overnight” Franklin said of becoming a more hard-nosed team. “We’ve got to keep stressing it on both sides of the ball. We’ve got some injuries that have factored into that, as well. But we need to be able to create space on offense, and we need to be more physical and strike our keys, and one-on-one matchups defensively. It’s obvious opposing defenses are loading up to stop Barkley, who has been held under 100 yards in six of nine games. And while there might be legitimate Xs and Os reasons for that, it doesn’t change the fact that a great running back is being held in check. When the subject comes up, Penn State personnel always talk about what the defense is doing. But Franklin was asked what he would tell people who believe that the onus should be on the offensive coaches to make the proper adjustments to still run well. “We can get into situations where we’re going to hand the ball off just to hand the ball off to Saquon Barkley,” Franklin said. “That’s not who are or what with we want to be offensively. We’re a spread RPO offense. And if you decide to overload the box based on numbers, we’re going to throw. And there’s a lot of offenses across the country that do it that way and are successful. As for being called a finesse offense, lineman Steven Gonzalez, who’s 6-foot-4 and 341 pounds, didn’t take exception to that label from his coach.